Our Skirts and Cockpit covers are made to our specs by the country's top manufacturer. actually make their own. Unfortunately, some kayak companies have started getting skirts made overseas. Rest assured, our Spray Skirts and Cockpit Covers are made in USA and are the best available. Our database includes cockpit sizes for just about every kayak made, even discontinued models. Call or email us if you need something that is not shown here. Click here to find your skirt size. Economical touring skirt with pocket and taped seams for watertightness. 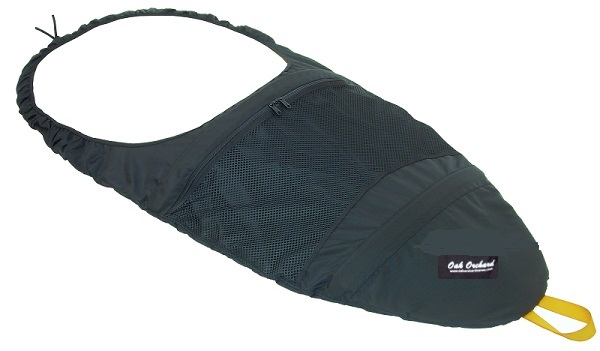 Skirt features dual shoulder straps for comfort and allows opening of waist for ventilation. An adjustable rim shock cord provides a secure fit. Adjustable waist. Adjusts to fit #1.7, 1.5, 1.4 and 1.2 cockpits by cinching knot in bungee. Waterproof coated nylon pack cloth with double stitched and sealed seams for dryness. We've enhanced performance by adding our adjustable tension Rim Grip shock cord sleeve that secures the skirt to your kayak's cockpit rim. New old stock SALE, limited Qty. We've enhanced performance by adding our adjustable tension Rim Grip shock cord sleeve that secures the skirt to your kayak's cockpit rim better. Custom made; Limited Qty available. Fits the Aruba 8 with 42 x 24 inch cockpit. Fits the Aruba 10 with 44.5 x 24.5 inch cockpit. We have not used this skirt on the Aruba 10ss, Aruba 12 or Aruba 12ss. -Call us if you need a skirt made for those models. Our custom size version of the Inlander skirt Made for a few kayaks that don't conform to the standard cockpit sizing. We've enhanced performance by adding our adjustable tension Rim Grip shock cord sleeve that secures the skirt to the rim. NOTE; this item is unique to Oak Orchard -custom fit! Marvel 10; made by Native WaterCraft/Liquid Logic. Marvel 12; made by Native WaterCraft/Liquid Logic. 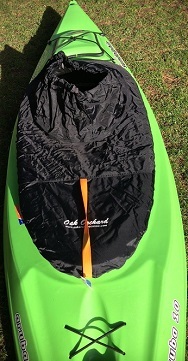 Sandpiper; made by Eddyline kayaks. Sound 120xe; made by Elie kayaks. NECKY Manitou II tandem kayak -stern cockpit, with the seat moved forward for solo paddling. NECKY Manitou II tandem kayak -stern cockpit, with the seat moved to the rear for tandem paddling. 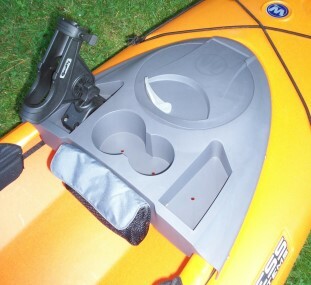 NECKY Manitou II tandem kayak -bow cockpit. 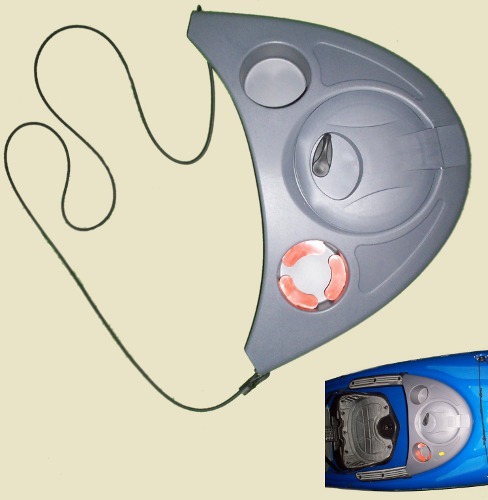 Hook or Sound; made by Perception Kayaks. Tupelo 12; made by Jackson Kayak. Tupelo 12.5; made by Jackson Kayak. "Made to Order" ...if you look up your kayak model in our fit guide and it says "made to order" that means we have a pattern on file so we can have one custom made. Click here to find your cockpit size. Kayaks shown here are either Loons or made from a Loon hull and renamed. Casco 100, Casco 120, Casco 138, Loon 86, Loon 100, Loon 106, Loon 120, Loon 126. Kayaks shown here are some of the more popular Perception models. Give us a call or email if you need help finding a skirt for your Kayak. Rec. 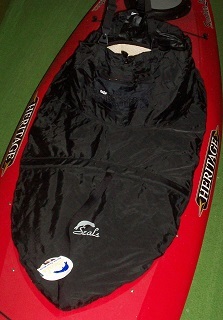 25 Model -fits Perception kayaks such as... Acadia 11.5, Acadia 12, Antigua 12.5, Acadia 12.5, Acadia 13.0. Skirt Color; black. Rec. 42 Model -fits Perception kayaks such as... Streak 9.5, Flow 9.5, Swifty 9.5 (not Swifty Deluxe or Swifty DLX). Skirt Color; black. Rec. 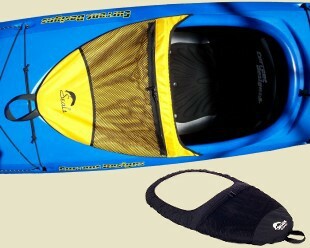 55 Model -fits Perception kayaks such as... Prodigy 10, Prodigy 12, Wave 10, Sunrise 10, Sunrise 12. Skirt Color; black. Rec. 70 Model -fits Perception kayaks such as... Patriot 12, Impulse 10, Swifty DELUXE 9.5. Skirt Color; black. 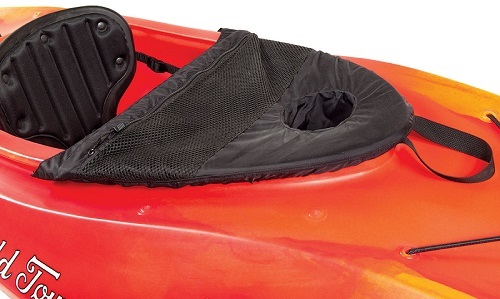 Youth Model -fits Perception kayaks such as... Prodigy xs, , Acadia Scout, Umiak. Skirt Color; yellow. Made to fit some of the more popular Wilderness Systems models shown here. Tour. 17 Model -fits Wilderness kayaks such as... Tsunami 120, Tsunami 125, Tsunami 140, Tsunami 145 (not fiberglass). Skirt Color; black. Rec. 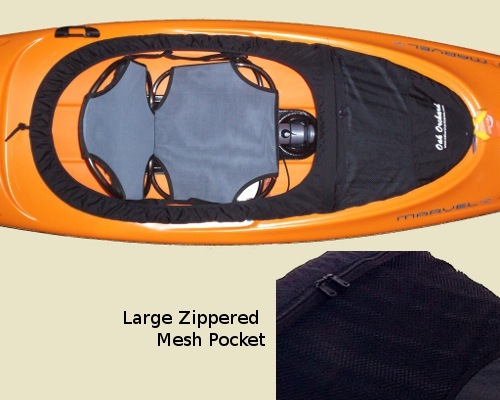 55 Model -fits Wilderness kayaks such as... Aspire 100, Aspire 105, Pamlico 100, Pamlico 120, Pungo 100. Skirt Color; black. Rec. 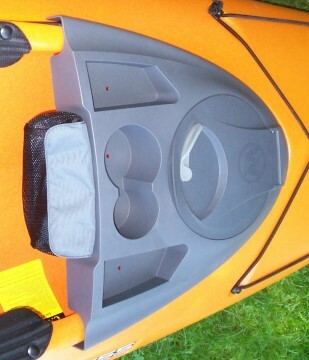 70 Model -fits Wilderness kayaks such as... 2019 Pungo 105, 2019 Pungo 120, 2019 Pungo 125. Classic Pungo 120 or 140. Skirt Color; black. Youth Model -fits Wilderness Systems Tsunami SP. Skirt Color; black. Note: this is the standard Seals version of the Adventurer sprayskirt. This skirt is made from medium weight nylon pack cloth with a water resistant coating. With Implosion bar, Removable suspenders, Adjustable waist, Rim grip, Double-stitched and Sealed seams. Note: If you need a more durable skirt that's Waterproof AND Breathable skirt please see our custom made Adventure GTX sprayskirt. 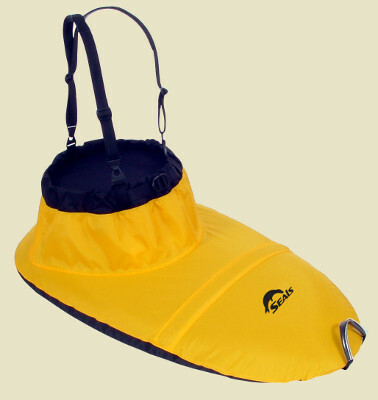 Note: this is the standard Seals version of the Adventurer spray skirt made for size #1.2 cockpits -yellow color. This skirt is made from medium weight nylon pack cloth with a highly water resistant coating and taped seams inside. Note: If you need a more durable skirt that's Waterproof AND Breathable please see our custom made Adventure GTX sprayskirt. Designed for size #1.2 cockpits -adjutable bungee design fits cockpits @ 32x18 to 29x16 inches. Our new GTX fabric is Breathable AND it's also the most Waterproof. 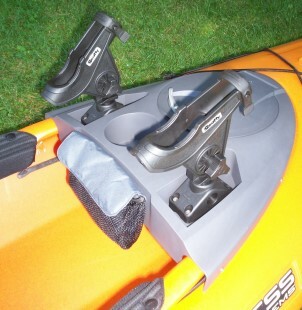 Rim grip technology keeps the skirt on your kayak when you need it. Double-stitched and sealed seams with an Adjustable Deck stay implosion bar keep you high and dry -sheds water and prevents puddles on your deck. Adjustable neoprene/velcro no-slip waist closure with removable suspenders means a great fit in all situations. Made in USA! Custom made for us by our good friends at Seals. Fits Old Town "Loon 120" made from 2006-2015 w/ 46" cp. Fits Old Town "Loon 138" made after 2005 w/ 46" cp. Fits Old Town "Sorrento 106" or "Sorrento 120"
Fits all #5.7 size cockpits, including the following Heritage kayaks: "FeatherLite 9.5ft", "FeatherLite 12ft" and "FeatherLite 14ft". Fits all #6.7 size cockpits, including the following OLD TOWN kayaks: "Loon 111", "Loon 111 elite", "Loon 138 elite", "Predator 111", "Predator 138", "Excursion 111" and the 11' 1" Voyager (Dimension or Old Town). Fits Old Town "Loon 138" made prior to 2006 w/ 58" cp. Fits OLD TOWN vapor 10, vapor 10xt, trip, trip 10 deluxe angler, vapor 12s, vapor 12, vapor 12xts, vapor 12xt and all vapor anglers. Marvel 12; made by Native WaterCraft. Marvel 12; made by Liquid Logic. Hook and Sound; made by Perception Kayaks. Waterproof coated nylon pack cloth with double stitched and sealed inside seams for dryness. Note; the Marvel 10 and 12 kayaks have been made with different brand names on them but they come from the same mold in the same factory. Marvel 10 cockpit is about 46x24 inches. Marvel 12 cockpit is about 56x24 inches. Marvel 10; made with Native WaterCraft logo. Marvel 10; made with Liquid Logic logo. Marvel 100; made with New Wave logo. Marvel 12; made with Native WaterCraft logo. Marvel 12; made with Liquid Logic logo. Marvel 120; made with New Wave logo. The SNEAK skirt is Made from water resistant coated nylon packcloth and features an adjustable shockcord sleeve, seam sealing and 2 accessory pockets. Adjustable waist tunnel with removable suspenders. Sneak has a water resistant zipper that runs from mid chest to the tensioned deck stay. Note: If you prefer a totally Waterproof AND Breathable AND more durable sprayskirt material please see our new custom made Adventure GTX skirt. Adjustable waist tunnel with removable suspenders. 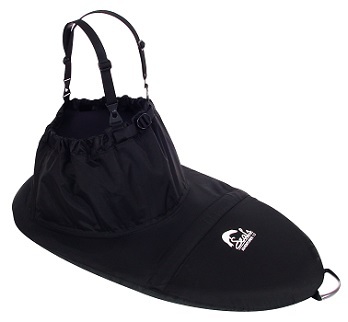 Made from water resistant coated nylon packcloth and features our Rim Grip shockcord sleeve, seam sealing, an accessory pocket, and a tensioned deck stay that prevents water from pooling up on the skirts deck. Note: If you need a totally Waterproof AND Breathable sprayskirt material please see our custom Adventure GTX skirt. We are phasing out the Coastal and Tropical Tour skirts in Favor of the new Adventure GTX sprayskirt. The Adventure GTX has the best features of the Coastal and Tropical at a great price. Adjustable waist tunnel with removable suspenders. 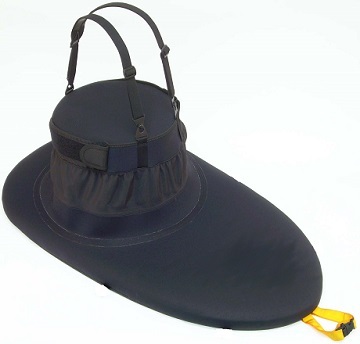 Made from water resistant coated nylon packcloth and features our Rim Grip shockcord sleeve, seam sealing, an accessory pocket, and a tensioned bow stay that prevents water from pooling up on the skirts deck. Our waterproof-breathable UltraLight skirt features an adjustable stretch neoprene waist closure and an adjustable stretch shockcord sleeve around the rim (fits #1.7, 1.5, 1.4 and 1.2 cockpits by cinching knot in bungee). Sealed seams and a tensioned bow stay keep the skirt high and dry by preventing water from pooling up on the skirts deck. Note: we are phasing out the UltraLight and Coastal and Tropical Tour skirts in Favor of the new Adventure GTX sprayskirt. 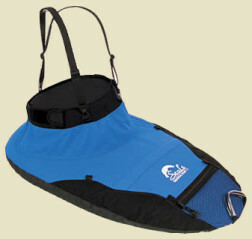 The Adventure GTX has the best features of the UltraLight, Coastal and Tropical at a great price. Waterproof coated nylon packcloth with double stitched and sealed seams for dryness. We've enhanced performance by adding an adjustable Rim Grip shockcord sleeve that secures the sprayskirt to the rim. Fits Perception "Acadia 11.5", "Acadia 12.0", "Acadia 13.0", "Acadia 12.5" and "Antigua" kayaks. Whether you're playing in the rapids or open water, our waterproof all neoprene Shocker sprayskirt will keep you dry all day long. Cockpit edges are reinforced for the most demanding scenarios. Designed to fit snug for maximum dryness. Available in all black only. NOTE: Waist tunnel sizes XS, XXL, and XXXL are made to order, which costs $15 extra. This is a custom, made to order skirt, drop shipped from our manufacturer. Allow 2-3 weeks to be made. We can make this skirt in a standard size or a custom size. Whether you're playing in the rapids or open water, our waterproof all neoprene Surf sprayskirt will keep you dry all day long. Note; Surf model may be customized... Shocker, Athena and Pro Shocker may Not be customized. Sorry, due to safety concerns no neoprene sprayskirts are made for cockpits over 40" long. Available in black, Royal Blue, Purple, Red, Gray, Athletic Gold, and Pink. Designed to fit snug for maximum dryness. This is the Heavy Duty or Expedition version of our "Surf" neoprene sprayskirt. Whether you're playing in the rapids or open water, our waterproof all neoprene Surf HD sprayskirt will keep you dry all day long. Note; Surf model may be customized... Shocker and Pro Shocker may not be customized. Sealtex patches reinforce part of the deck of a Shocker or Pro Shocker. This skirt has Sealtex reinforcing over the entire deck. Maximum performance from a touring sprayskirt. The Extreme Tour's deck is constructed of 4.0 mm neoprene with Seal-Tex fabric topside for extra durability. The 3/8'' stitched bungee, complete with the underside rim seal coating, holds the skirt securely to the rim. Our seam-sealed performance waist tunnel is made from waterproof-breathable Sympatex fabric and has an adjustable neoprene/velcro waist with removable suspenders. Available in all black only. Note: If you need a Waterproof AND Breathable skirt please see our Adventure GTX skirt. High performance 3.5 mm neoprene deck. Waterproof, breathable fabric tunnel with adjustable neoprene waistband. E-Z stretch 3/8" stitched bungee attachment to the rim. More stretch than the Extreme Tour, which makes this easier to put on, while still being very secure. More stretch also means it may fit certain non-whitewater boats better than other neoprene skirts. 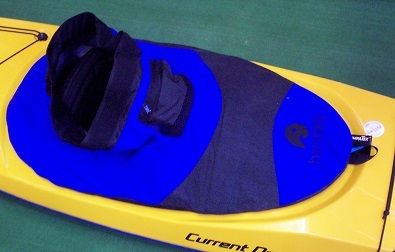 A great skirt for a wide variety of kayaks. Stitched bungee attachment to the rim. 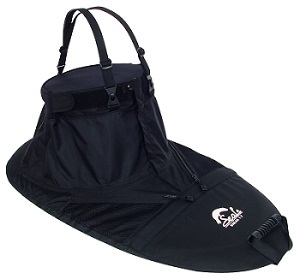 A great skirt for a wide variety of kayaks. Sea Sprite can be customized for special features. Sea Sprite can be customized for cockpit shapes up to 40". Extreme Tour may not be customized. Choose Extreme or EZ Stretch Bungee. Choose 9 inch or 6 inch waist tunnel. Choose from standard or made to order cockpit shapes. Tandem Spray Skirt made of Urethane-Coated nylon pack cloth with an Adjustable bungee sleeve which fits around the cockpit rim. Two Adjustable drawstring waist tunnels fit up to @ 43". Note: this skirt is for a tandem kayak that has one big cockpit with two seats in it. Choose t-80, t-100, t-200, t-300 OR t-400 sizes available. Waterproof coated nylon packcloth with double stitched and sealed seams for dryness. Adjustable waist feature allows skirt to be pulled on over head or stepped into. NOTE; this item is unique to Oak Orchard, it has helpful features beyond the basic spray skirt for the best fit available anywhere! OLD TOWN: "Loon 15t" or "Loon 150t"
-with Rim Grip technology and our adjustable bungee fit system. Made in USA. 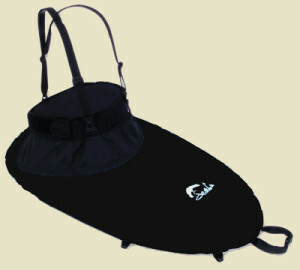 This is NOT for Old Town Loon tandem kayaks; we make specific skirts just for Loon tandem kayaks. Fits the following kayaks and perhaps a few others: Boreal Design; Ookpik Duo, Dagger; Bayou 2 Perception; Acadia II, Jocassee, Keowee II, Keowee III, Sanibel, Walden; Spirit. Perception: "Sundance II tandem", "Aurora tandem"
Wilderness Systems: "Pamlico 135T tandem", "Pamlico 145T PRO fiberglass tandem", "Pamlico 160T tandem"
Waterproof coated nylon packcloth with double stitched and sealed seams for dryness. Made in USA. Adjustable waist feature allows skirt to be pulled on over head or stepped into. Old Town: "Loon 160T" "Loon 16 tandem" "Loon II tandem"
Heritage: "TandemLite", "FeatherLite Tandem" or "Alpha Tandem"
Made to fit Old Town two person kayaks. 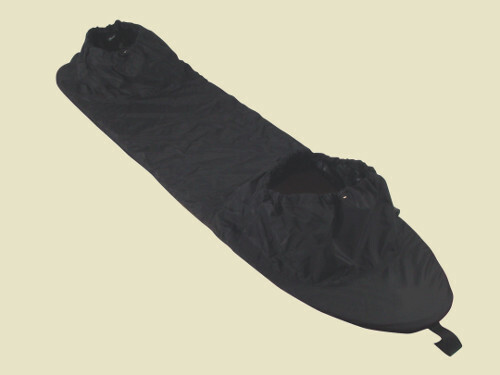 This is a 2 tunnel nylon recreational spray skirt, each tunnel is adjustable for different waist sizes. NOTE; this item is unique to Oak Orchard, it has helpful features beyond the basic spray skirt. Select your model below. Available to fit Loon 138T, Loon 160T, Twin Otter, Twin Heron or Loon 15. Made to fit Perception two person kayaks. This is a 2 tunnel nylon recreational spray skirt, each tunnel is very adjustable for different waist sizes. NOTE; this item is unique to Oak Orchard, it has helpful features beyond the basic spray skirt. Select your kayak model below. Made to fit Wilderness Systems two person kayaks that have one big cockpit with two seats. This is a 2 tunnel nylon recreational spray skirt, each tunnel is very adjustable for different waist sizes. Note... Pamlico 145t old = 2012 or prior. Note... Pamlico 145t new = 2013 or newer. Medium-weight coated nylon packcloth. Large zippered mesh pocket. Tensioned deck stay sheds water. Double-stitched and taped seams. Adjustable bungee cord for a more custom fit. Available in Black (our special Athletic Gold color is next item down). Length of skirt deck (front to rear) 17"
Available in our special Athletic Gold color (basic Black is next item up). This custom made 1/2 skirt is longer than our Splash Deck but shorter than our Splash Deck X. We started this design to fit a few kayaks that don't conform to the standard sizing. Another issue we resolved was to have more open space in the cockpit (between the skirt deck and the paddler). Recommended for cockpit sizes 4.2 or larger. Length of skirt deck (front to rear) 20"
Length of skirt deck (front to rear) 25"
Medium-weight coated nylon packcloth. Large zippered mesh pocket. Integral cupholder. Adjustable bungee cord fits around cockpit rim. Medium-weight coated nylon packcloth. Large zippered mesh pockets. Tensioned deck stays. Double-stitched seams. Adjustable bungee cord. 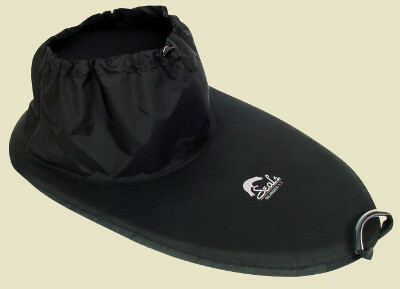 Keeps drips and splashes off you and your partner as you paddle.